Featured image shows curb cutaway allowing rainwater to flow from street into designated plant area. Come see and learn how the rain can be a great resource for our community by enhancing its beauty, its sense of place and to create a more welcoming space. Your home, street and business can be a productive unit of water instead of a consumer unit of water. Rain water is a great resource to bring additional value to your community. 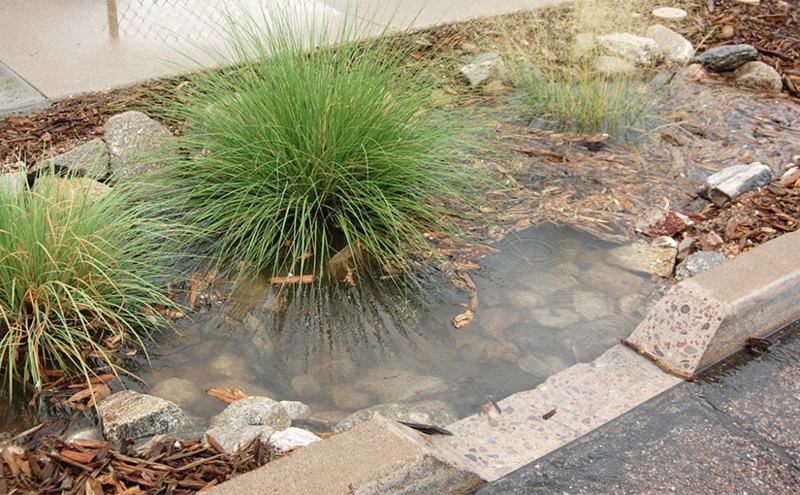 See what is going on with rain water harvesting in Tucson and learn what can be done for your neighborhood to put rain water to beneficial use! This talk is presented by Joaquin Murrieta-Saldivar PhD, a Cultural Ecologist with the Watershed Management Group. Joaquin specializes in building resilience in diverse communities working with people, culture and natural resources. He is a graduate of the University of Arizona with MSc in Natural Resources and Agricultural Economics and a PhD in Renewable Natural Resources Studies with an emphasis on management, policy and economics of natural resources. Gentle Ben’s is generously providing appetizers, so please RSVP by August 6th so we’ll have an accurate headcount! Sponsored by West University Neighborhood Association and Gentle Ben’s Brewing Company!